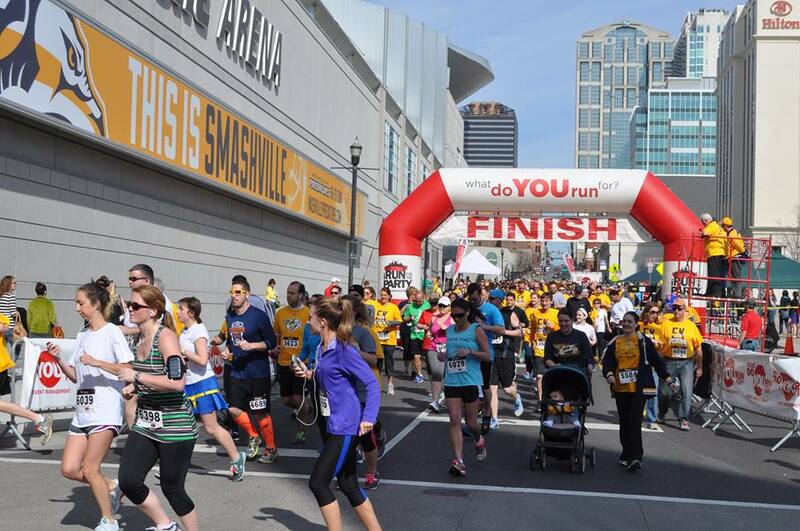 When this race happened last year in February, I was in the early throes of Couch to 5k. It was not even on my radar. But as I kept running, I found myself awaiting the announcement of the 2014 dates. After I signed up for the Hot Chocolate 15k, I thought there would be a conflict. But then…it was in March! 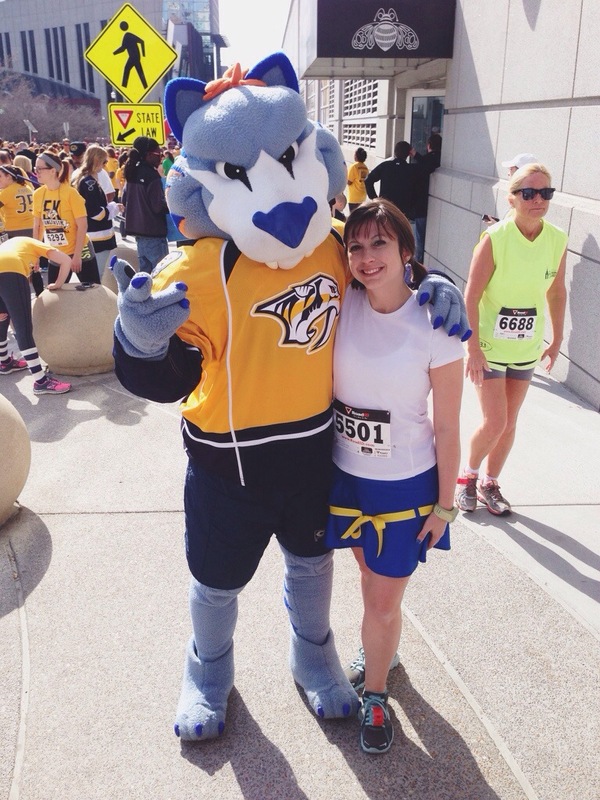 I immediately signed up because I heart the Predators and I heart free tickets. Fitting this race into my half training schedule was a little bumpy, since my Saturday was supposed to consist of a five mile run. But since there was a 70% chance of rain on Sunday, I decided to do eleven miles total on Saturday and move my five miler to Sunday. I figured I could just run the 5k with a one mile warmup beforehand in the morning and a seven mile easy recovery run following right after on the greenway to make up the mileage. And, while I wanted to race well, I also had to consider that I had those seven miles plus the five miles scheduled for the next day. I knew if I really pushed it, I could probably finish in 32 or 33 minutes. But I thought this probably wasn’t the race for a PR, despite my excitement coming off of my 15k time and the speedwork from two days before. Thus, my goal time was to do around what I had done for my last few 5ks: 35 minutes. My friend Chris was running the race with me. He had just graduated Couch to 5k a month earlier, so this was his first real 5k race. 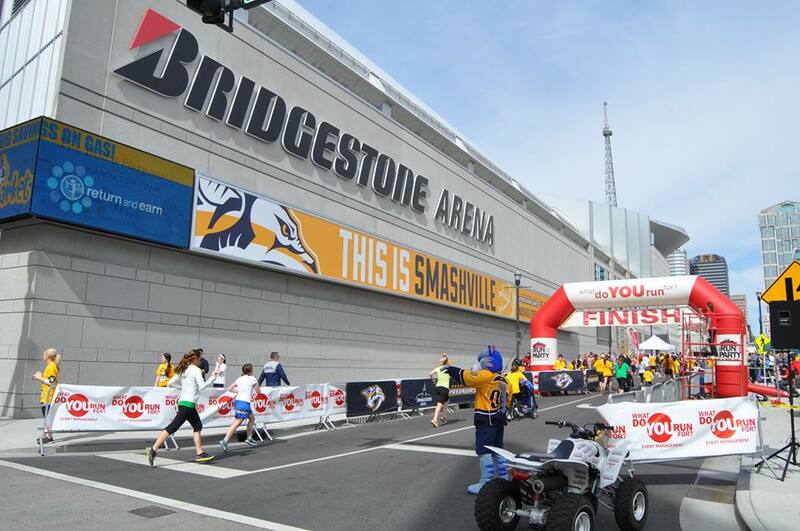 I met up with him a little after 9am on the day of the race, and we headed down to the arena to pick up our race bibs. Packet pickup was quick. There was no bag check (I wasn’t expecting one for a race of this size), so we went back to the parking garage to throw our race tees in our cars. After that, I started my one mile warmup. Chris chose to tag along, so I kept it really easy, around a 13:30 mile. After a photo with Gnash and a sip of water, we chose a spot in the crowd to start. I tried to pick a spot in the middle-back, so hopefully we wouldn’t be behind too many walkers, but also past all the speedy people. Except I’m not sure the people in this race really knew how to line themselves up, as we ended up around both speedy people and walkers. Oh well. They were prompt in starting the race, which I always appreciate. Start line photos are a little like Where’s Waldo. Can you spot us? Let me talk about the weather for a second. It was a gorgeous day outside. But perhaps not entirely running friendly. It ended up being the maybe the second or third 70+ degree day we’ve had this year. The race started at 10:30am, so it was starting to warm up pretty good. And the sun was out. When I initially checked the weather for the race, it was supposed to be race-perfect: around 55 and cloudy. It ended up being around 60 and sunny. Not terrible, just not ideal. The course itself was an out and back. We traveled down Demonbreun to music row, around the Musica statue, with a turnaround point at Edgehill. This means the first half of the race is mostly uphill, while the second half is mostly downhill. As soon as we started, we were staring at the uphill that is Demonbreun from fifth to eighth. “Good luck on the hills!” I called out to Chris as we took off. I started up the incline around an 11 min/mi pace. A few rolling hills later, I was at the bottom of the biggest hill of the entire race: the hill on Demonbreun that goes up to the roundabout where the statue is. I thought about walking it. But I didn’t. I charged up that quarter mile section around a 10:30 min/mi pace. And I was greeted with a sweet, sweet downhill and the start of the second mile at the top. Down 17th Street was much a blur. I know that I wasn’t entirely feeling this race, but I made myself go on. At the halfway point was the sole water station of the race. I had told myself I could take a walk break there, but when I got to it, I grabbed a cup and kept on running. Then, of course, proceeded to dump half the cup on myself because it’s really hard to run and drink water at the same time. I can’t even walk and drink water out of a cup at the same time. I tried the pinch technique, which at least got some of it into my mouth. Up 18th was much like going down 17th. There were some people outside in their yards that would occasionally cheer us on, but not a ton of crowd support, except at the beginning and end. Soon I was back at the Musica statue and got to run back down the Demonbreun hill. Why, hello, 8:30 min/mi pace! At this point, there was less than a mile left. I hadn’t looked at my watch much the whole race, so when I glanced down at the start of the third mile, I was surprised to see how fast I was going. No wonder I kept wanting to walk. I did some calculations in my head. Pretty much, no matter what, I was going to PR. I could stop and walk and I would still PR. I knew I wasn’t going to break 30 minutes (I have plenty of time for that later this year), so I told myself I could take a break if I wanted to, knowing that I had seven more miles to run later. But my legs laughed at me. “You’ve come this far,” they said. “It’s mostly downhill from here. Just finish it out.” So I did. Picking up speed towards the finish! I crossed the finish line in 31:25, according to my watch. Nearly a four minute PR. Nothing has ever felt as good as stopping running did! I grabbed a banana and a water and situated myself near the finish line to wait for Chris. 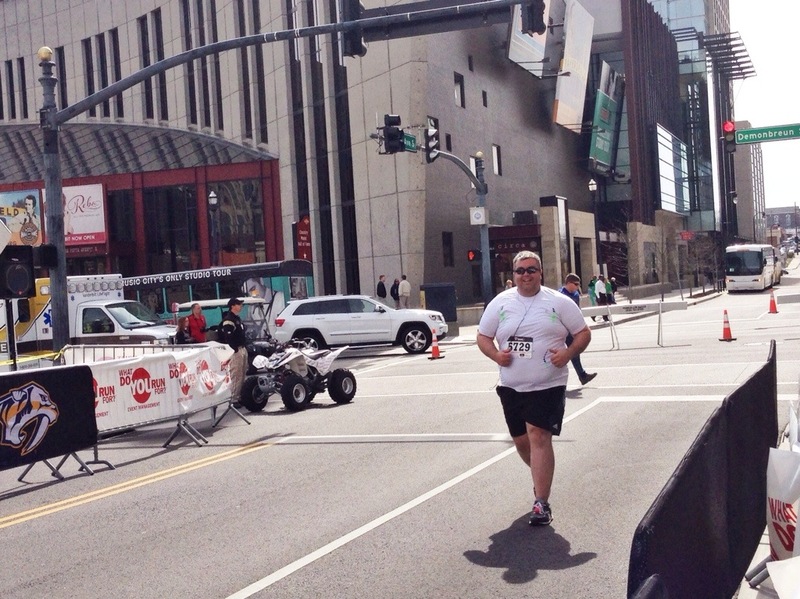 He rounded the corner and finished a little past 46 minutes. So proud of him! After he went to grab some water and food, I picked up a bagel. Best bagel ever. We walked over to where they were posting the results, and I found my name. It said my time was 31:23! Later, I checked the results on the website and they said 31:25, just like my watch. I guess I’ll go with that for my official time. 22nd in my age group though! 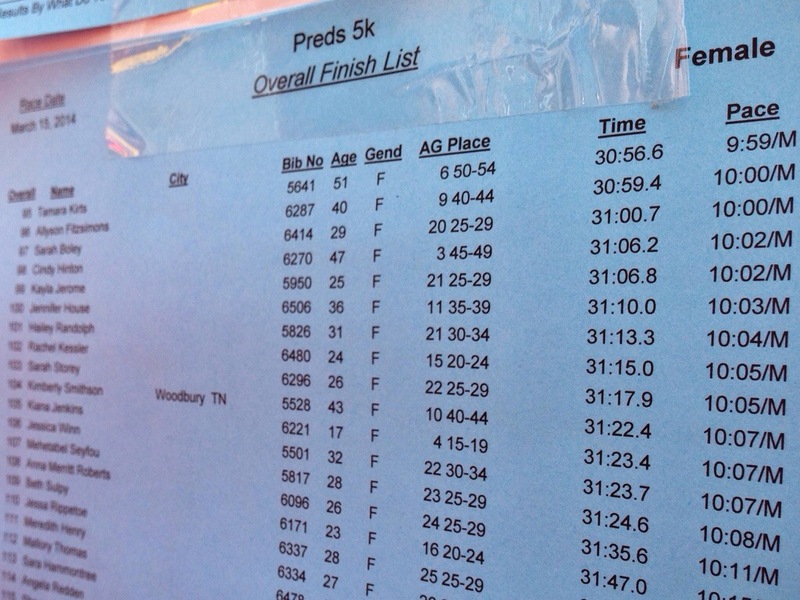 The results as posted on race day, which are 1.5-2 seconds shorter for everyone than what they posted online. I’m bib 5501. In addition to my best 5k time, I ran two sub-10 minute miles, which I’ve never done before. One, sure. Two? No. Let’s just let that sink in. It’s looking really good for busting that 30 minute 5k barrier later this year! 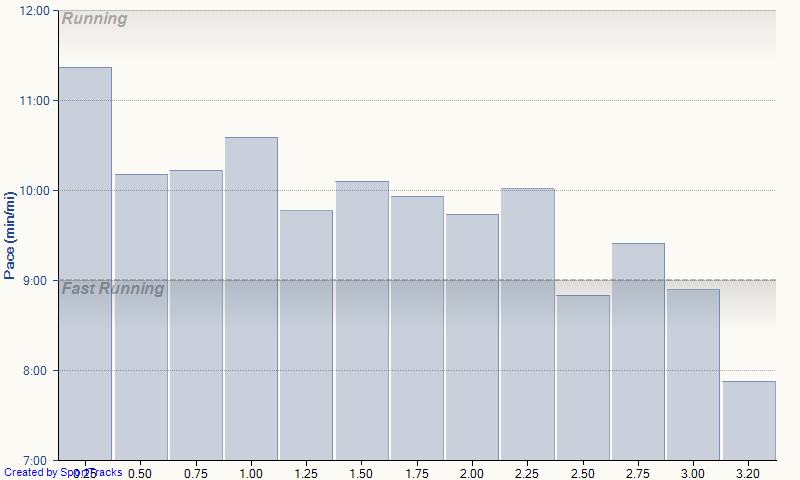 I managed to have negative splits, which was kind of expected based on the elevation profile of the race. My slowest mile was the first, at 10:39, and my fastest was the third, coming in at 9:19. I didn’t run tangents very well on the first mile, since I had to weave around a lot of walkers at the start, so in a more correctly seeded race, I think I could definitely be faster there. Here’s my quarter mile splits. You can see they were fairly even throughout after the first one, just speeding up in the last half mile or so. The first quarter mile was on a hill and I was weaving around walkers, so it makes sense that it’s the slowest. The next slowest one is the aforementioned hill on Demonbreun. Look at that finishing sprint!